Question: Under what circumstances would you ever use the names Babe Ruth and Jose Hernandez in the same sentence? For a statistical novice like myself, Batting Average on Balls in Play is one of the most confusing stats around. Measuring the stat isn’t the confusing part. For every ball a batter puts in fair play that doesn’t go over the fence and isn’t a sacrifice bunt, how often does he get a hit? Historically, league average has hovered around .300. Teams’ increased emphasis on defense in recent years has knocked that figure slightly lower; it’s .291 this season. Interpreting the stat, especially from a batter’s perspective (and in this post, I’m not considering the pitching side of things, which is influenced by team defense and other factors), is where things get rocky. But I’m a sucker for arcane statistical milestones, and BABIP happens to boast a nice round number that is virtually unobtainable by today’s major leaguers: .400. It’s the holy grail of BABIP, and a close study of its many suitors points us to a forgettable shortstop named Jose Hernandez and one of the most extreme cases of season-long luck in the history of the game. First, a quick primer. BABIP is largely an indication of luck; how often your hits find a hole. (Some people prefer the term “random variation.”) But there are a few other elements besides fortune that can influence BABIP. If you hit the ball hard and straight, it’s more likely to land as a hit. If you can leg out more than your fair share of infield hits over the course of a season, your BABIP will go up. Speedy players who hit a lot of ground balls tend to do well here. From 2005 to 2009, Coors Field had the highest BABIP at .322, while Petco Park in San Diego had the lowest at .282. This skill, tantamount to magic, seems to belong only to Derek Jeter and Ichiro Suzuki over the course of a career. There’s no surer way to make outs on balls in play than by hitting cans of corn to stationary infielders. It can take nearly a whole season’s worth of plate appearances before we can feel confident that a player’s pop-up rate is for real. But there are some hitters who hit more pop-ups than others, and that obviously dings their BABIP. Still, these and other elements typically pale in comparison to the random variation factor. Wild fluctuations year to year, in the same player’s career, prove that a slightly higher line drive average or more infield hits often mean very little to his BABIP. Luck tends to trump these variations, rendering the stat mostly independent of individual skill. One of the main ideas behind BABIP is that it can help fans, scouts, and general managers predict what a player’s average will do in the near and distant future. A historically good hitter with a low BABIP for part or even all of a season isn’t cause for concern; it’s likely it will rise the following year. On the flip side, it’s best to not be deceived by a traditionally weaker player who happens to have an inflated average due to a high BABIP. He’ll come down soon enough. Now for the good stuff. Let’s look at the curious case of Jose Hernandez. In 2002, his BABIP over 152 games with the Brewers, most of them played at shortstop, was a staggering .404. His line drive percentage was slightly higher than it would be later in his career (that particular stat only goes back to 2002 on Fangraphs), but his infield hit percentage was much lower. The two years before, playing at the same park with the same team, his BABIP was .313 and .327, respectively. His career BABIP ended at .324. So what happened in 2002, when Hernandez’s batting average jumped 39 points from 2001 before plummeting 62 points the season after? Simply put, he had one of the most randomly variable years in the long history of baseball. Actually, to hell with understatement: Hernandez had the luckiest season ever. To put his year in context, check out the complete list of players with 502 or more plate appearances and a BABIP over .400 in a single season. There, you see names like Babe Ruth, Rogers Hornsby, Ty Cobb, Roberto Clemente, George Sisler, Manny Ramirez, and Rod Carew. In fact, there is exactly one player on that list besides Hernandez who finished his career with a batting average below .300 — Heinie Zimmerman, who hit .295. Hernandez? He retired with a career .252 average. The full list is only 23 names long. In the past 35 seasons, players have reached this plateau only twice: Manny Ramirez in 2000, and Jose friggin’ Hernandez, the career .252 hitter. With the other names, from Manny back to Cobb, it’s an easy guess that great hitting ability combined with luck propelled them above .400 for those special years. There are prototypes today, guys who hit for average, run fast, and seem to find holes at a high rate. Jeter and Suzuki are foremost among them, and it should come as no surprise that they’ve both come very, very close. Jeter posted a BABIP of .396 in 1999, .391 in 2006, and .386 in 2000. Ichiro came close to .400 in 2004, with a BABIP of .399. In 2007, it was .389, and in 2009, it was .384. Among players with 800 games played, they rank first (Jeter) and second (Ichiro) in career BABIP. With smaller sample sizes to judge from, younger players like Detroit’s Austin Jackson, L.A.’s Matt Kemp, and Cincinnati’s Joey Votto have excelled at BABIP. With less than two seasons under his belt, Jackson actually sits at fifth all-time in career BABIP, behind Tom McCreery, Ty Cobb, Wee Willie Keeler, and Tuck Turner. The question is, will we see another .400 BABIP year anytime soon? Clearly, it’s become a harder feat to manage in the modern era. Between 1901 and 1936, 19 players managed to eclipse .400, a rate of more than one every two years. Since then, only four players have broken the mark, a rate of one every 19 years. 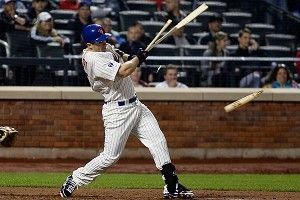 So far, about a quarter of the way into the 2012 season, David Wright has posted a .459 BABIP. The highest of all time is Babe Ruth’s .423 in 1923. Behind Wright, Bryan LaHair, Kirk Nieuwenhuis, Michael Bourn, Josh Hamilton, and Ryan Sweeney all stand above .400.
well, more statistical anomalies, one after the other, becoming more improbable with each passing game. And, though I’m fairly certain that nobody has ever uttered these words before, Jose Hernandez only comes around once in a lifetime.